These adorable “Cute as a Button” scented soaps bring an enchanting expression to life—and to your baby shower or christening. 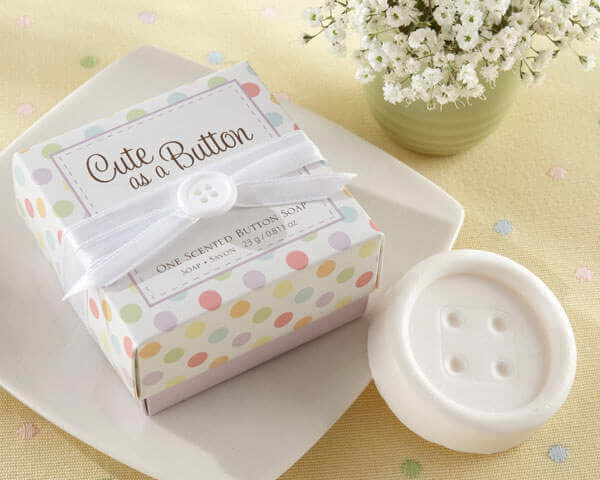 Perfectly white and sweetly scented, our adorable button soap favour celebrates the one characteristic all babies seem to acquire in just nine months! Sew precious! Please note these are factory seconds due to the ribbon on the boxes covering the “cute as a button” wording on the front of the boxes. Some are not covered and some are, it does not effect the product in any other way. Thank you so much for the very prompt service and lightning fast delivery! The presentation and quality of the bonboniere I ordered for my daughter's baptism was superb.